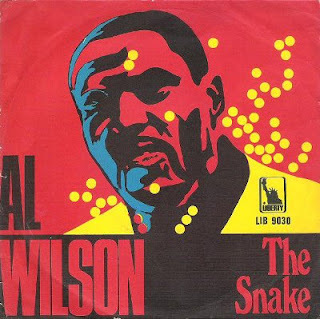 Back in 1968, Al Wilson had his second biggest hit (his biggest was "Show & Tell") with the song "The Snake" (1968 / #27 Pop / #32 R&B), written by Oscar Brown, Jr.
On Sunday (February 25), Maggie Brown, the daughter of the songwriter who died in 2005, told MSNBC that President Donald Trump is using the lyrics to "serve his own campaign and climate of intolerance and hate — which is the opposite" of her father's intent with the song. In the song, a woman finds a half frozen snake and takes it into her home to save its life only to have the snake bite her fatally. Trump has been using the song to illustrate the dangers of an open borders policy, including in his speech over the weekend at the CPAC convention where he reportedly said "with glee" (Huffington Post) “You knew damn well I was a snake before you took me in”. Brown went on that her father believed that "with the grace of God, you need never fire a shot. He was against guns in the schools... or any of this stuff Donald Trump stands for. That is super insulting." Both Maggie and her sister have called on Trump to stop using the song. Other hits written by Oscar Brown, Jr. included "A Young Girl" (Noel Harrison / 1965 / #51 Pop) and "Work Song" (Herb Alpert & the Tijuana Brass / 1966 / #18 Pop / #2 Adult Contemporary) along with his own "The Lone Ranger" (1974 / #69 Pop / #27 R&B). Oddly Stephen Colbert in his cold opening last night had Trump's CPAC convention appearance, in which Mr Trump AGAIN read from "The Snake," parodying it with a cartoon python in the audience. She is absolutely right to be fighting this.